The Lowel Ego Light is a tabletop fluorescent softlight. Now anyone can create great looking professional results in their home. Setup is easy: plug it in, place it on the table, and turn it on. The result is 5000° light output that's ideal for taking digital tabletop shots by collectors, arts and crafts hobbyists, sellers, archivists, and desktop publishers. Ego can also be used for DV talking head shots, digital still portraits, and webcam desktop video conferencing. Each Lowel Ego fixture in this 2 light 220-240 Volt AC kit comes supplied with 2 custom 25 Watt screw-in compact daylight fluorescent lamps. Also included is a hinge-folded white bounce card for easily reflected fill, and the Ego Sweep, which consists of a corrugated plastic sweep with hinged plastic easel support, and 10- 24 x 36" assorted colored paper background sheets. 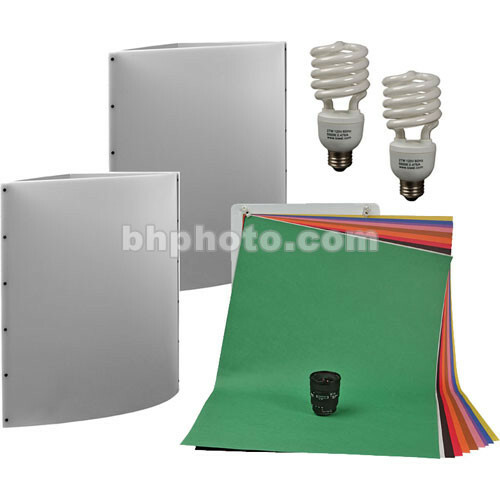 Ego Sweep Background System - 24x36"
Box Dimensions (LxWxH) 32.0 x 20.3 x 11.0"
Ego Fluorescent 2 Light Kit (220-240V) is rated 5.0 out of 5 by 2. Rated 5 out of 5 by Andrey Goncharov from Good purchase for home photography I purchased this set to take pictures of small objects at home to accommodate the sweep, reflectors and lights on a small table. First impression on quality - a little week and flimsy, but this is OK for home use. The set is easy to install and use and it helps to produce well-lit pictures. Rated 5 out of 5 by Andrew W from Lowel Ego 2 light kit My company needs photographs of small electronics products, for our web site, brochures, etc. We've spent years mucking around with various lights, obtaining average results at best. We've used professional photographers for some shots, but most of them don't have the experience to photograph small electronics well -- their lights are too big.One of my staff suggested the cocoon (which he had used in his previous job), and during my research for this, I stumbled across the Lowel Ego.The Lowel Ego is an excellent product. The lighting it provides results in superb (professional) photographs. The sweep and coloured backgrounds are truly useful. This solution provides significantly more shooting options and flexibility than the cocoon.After 4 weeks, and lots of photographs, we're thrilled. Problems Encountered: The build quality of some items is not what I expected, however, it is more than fit for purpose. Previous Equivalent Items Owned: Various fluorescent lights. No professional lights. Are these lights available for use with an Australian socket? While this kit does contains light fixtures which are 220-240V compatible, you would still need a plug adapter in order to use them in Australia. Please see the image below for reference. how big and heavy is the box? The total kit weight would be 15.9 lbs. The dimensions of the original packaging are 33 inches long x 20.5 inches wide x 12.5 inches high.